So much of the time in reviewing a recording, we look for the new, the surprising, the twist or the turn. Once in a while a recording like Mbalimaou comes along offering none of these, and is still fresh and exciting. 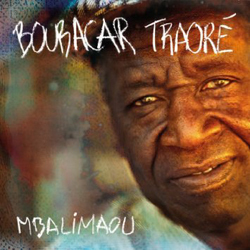 Boubacar Traoré is now in his 70s and well into his second time around as a career musician. This is his 9th album since 1990's Mariama (Stern's Music), the European recording that relaunched his music to the world, right at the beginning of the 'world music' scare. Mariama was a solo affair, just voice and guitar, recorded so raw you could hear his fingers on the strings and his breath between vocal lines. It was my introduction to him and I was spellbound. Since then he has presented his music with ensembles large and small, sometimes decidedly local, other times globally enriched. Mbalimaou rides the middle ground with a core group of African musicians on n'goni, percussion, kora and voices. Primarily recorded in Bamako (with some added dubs and mixing done in France), it is simple and clean - truly folk music in spite of all but one song being Traoré originals. Producers Christian Mousset and Ballaké Sissoko (who also contributes kora on a number of tracks) have kept the sound clean and dry, as if you are sitting in a small room with the musicians instead of a hall or studio. It's personal. And the performance by Boubacar Traoré is personal. His voice is a thing of rugged beauty; his guitar playing a prod to the ear - crisp and punctuated. It is accented rather than overwhelmed by the musicians assembled in the studio. The opening track, "Dounia Djanjo," sets the pace with a solid rhythm set by calabash and scraper, chased by the n'goni, all standing in contrast to Traoré's gentler guitar and easy going vocal. One of the highlights of the album is a reprise of the traditional song that renewed his recording life in 1990. On "Mariama" he is joined by kora, calabash and harmonica for a sad song of a young girl learning of the death of her mother. Traoré's voice is breaking and a harmonica adds a strangely timeless and placeless edge to the sound, yet the rhythm remains optimistic and mildly upbeat. Fabrice Thompson's harmonica makes other appearances here and there, and in "Africa" he brings in a more recognizably blues aspect, peppered by bits of electric guitar. (Is that Traoré? The notes do not say. ).